The PhytoRelaxer is revolutionary, non-chemical; it relaxes or texturizes the hair for maximum safety. The egg and soy based formula straightens the hair just like your traditional relaxers; it is odorless and does not contain lye. The PhytoRelaxer straightens from fine to resistant hair, providing, optimum hydration, intense nutrition and strengthening. With this PhytoRelaxer, we provide a complimentary reconstructor treatment. Q: How does the PhytoRelaxer differ from other relaxers? A: It does not contain lithium, calcium, sodium hydroxide or thio. Q: What are the active ingredients in the straightener? A: The active ingredients are a complex of egg and soy extracts. These ingredients are from 100% botanical origin and are hypoallergenic. Q: Is the PhytoRelaxer compatible with all relaxers? Q: Can the PhytoRelaxer be used on previously highlighted or color treated hair? A: The PhytoRelaxer should not be used on highlighted/bleached or henna treated hair. You can use it on color treated hair. 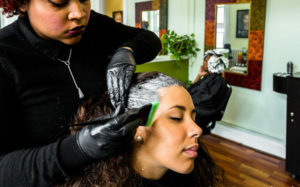 The overall condition will determine if the hair is ready for relaxer. Q: Can I color my hair the same day of the PhytoRelaxer application? A: Yes, only if colored with semi-permanent, or deposit only color. Q: Is the PhytoRelaxer safe to use during pregnancy? A: Yes, it does not contain any of the harsh chemicals usually associated with relaxers. We recommend this the PhytoRelaxer for all relaxer candidates. Those that are natural and want to soften the natural curl pattern for manageability. I recommend the PhytoRelaxer for all the reasons listed above. Our goal is “FABULOUS HEALTHY HAIR!” Rock it!!! !